BEDFORD, MA -- Featured on this week’s alumni update are a pair of ex-Wizards that are still playing together at Stevenson University. 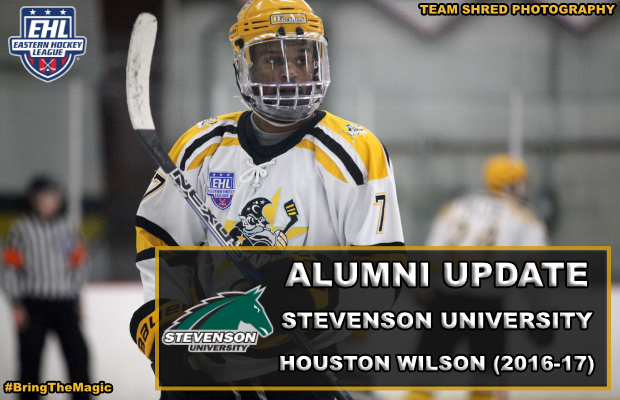 The Stevenson Mustangs are a Division III program located in Pikesville, MD, and play out of the newly formed United College Hockey Conference (UCHC). Matt Cappucci (defenseman) and Houston Wilson (forward) both committed to Stevenson at the end of last season, after each of them put together strong campaigns respectively with the Wizards. The season is underway, and with no surprise, Cappucci and Wilson have both earned spots on the team. Through the first 3 games for the Mustangs, Wilson has dressed for 2 of them and picked up a goal and two assists in the team’s 7-1 against Lebanon Valley College. 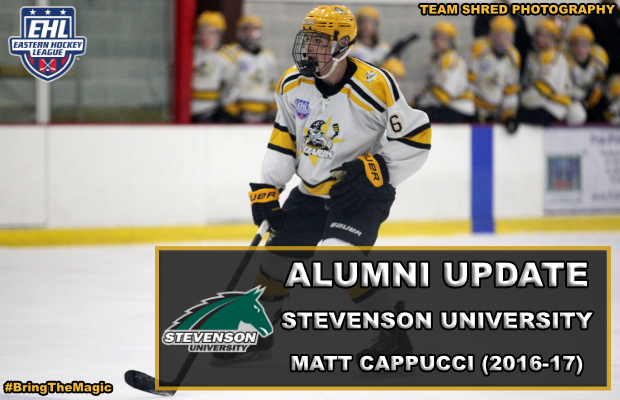 Cappucci, a criminal justice major, has been active for one game so far this season. Following the strong performance against LVC, Wilson was named the UCHC Rookie of the Week. Up next for the 2-0-1 Mustangs, are a pair of conference games on the road. Friday’s game against Kings College, will feature yet another Wizard’s alum as Eric Menninger has earned a roster spot on defense for the Monarchs. Make sure to follow the alumni updates every week as next week’s story will feature King’s College own Eric Menninger.